» Midtown Crossing Sign District: Why Hold a Public Hearing Now? And Why Should the City Trust the Developer to Live Up to Agreements? Midtown Crossing Sign District: Why Hold a Public Hearing Now? And Why Should the City Trust the Developer to Live Up to Agreements? On Monday, April 6, the city planning department will hold a public hearing on a proposed sign district to allow more than 15,000 sq. ft. of supergraphic billboards around the outside of the Midtown Crossing shopping center under construction by CIM Group at Pico and San Vicente Boulevards. And a hearing has been scheduled before the City Planning Commission (CPC) in May, even though the CPC three weeks ago approved a new sign ordinance that would require this and several other sign district applications to proceed under new, more restrictive criteria which the Midtown Crossing proposal clearly could not meet. See hearing notice. In addition, the CPC voted against a recommendation that all seven sign district applications pending in the planning department be “grandfathered” and allowed to proceed under the existing ordinance. Instead, the commission exempted only two sign districts that have been approved by the CPC and are awaiting action by the City Council. There is no guarantee that these provisions will be intact by the time the City Councils votes on the new sign ordinance, expected sometime in late May. Still, the question remains over whether this sign district application is being “fast-tracked” in order to get it before the Council ahead of the new sign ordinance, which would limit sign districts to specific areas of the city and require a mandatory removal of existing signs in the surrounding community. Representativess of the CIM Group told a neighborhood council committee last month that the project could not be built without the revenue from the signs, which would advertise goods and services other than those sold by the stores in the shopping center. An L.A. Times article last year reported that the company has received nearly $15 million in city redevelopment subsidies, and that investors in the company’s real estate fund were told to expect 20% returns. CIM Group is no stranger to controversy regarding billboards and supergraphic signs. As reported in a February article in the L.A. Times, the company put up six huge supergraphic ads on a building in Hollywood even though only three were permitted. The company has also failed to remove two rooftop billboards from the property, even though it had agreed to do so months earlier. The Times reported early last month that the company had agreed to remove the billboards, but as of the end of the month they were still in place. 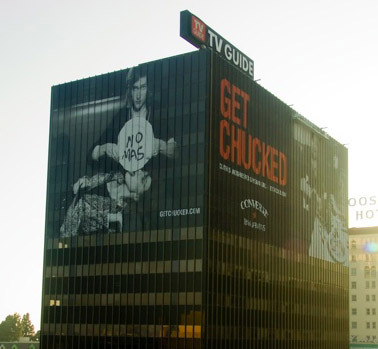 According to the city’s department of building and safety, the company was cited twice for allowing illegal supergraphic advertising on its headquarters building on Hollywood Blvd., and the case was referred to the City Attorney’s office for criminal prosecution. And it removed a supergraphic sign displaying a statue of liberty image from the side of an historic building in Hollywood only after being threatened with a large fine for breaching an agreement giving it property tax breaks in exchange for renovating the building and keeping its historic features intact. SkyTag, Inc. the purveyor of the statue of liberty images and other images and commercial supergraphics scattered over a wide area of the city, is asking the federal court for an injunction barring the city from enforcing its supergraphics ban on 27 buildings, including the two mentioned above and four others owned by CIM Group. The company told the L.A. Times that it has no involvement with that lawsuit. The claim by CIM Group that it cannot finish the Midtown Crossing development without the revenue from signs isn’t the first time they’ve made such a claim. Last year, in arguing for exceptions to the Hollywood sign district to allow two 60 ft. high billboards atop a Hollywood Blvd. building, they claimed the ad revenue was required to support renovation of the property. However, in the past CIM Group developed a number of properties in Santa Monica, which has an absolute ban on off-site signs. The company is also developing properties in Pasadena, Anaheim, and San Jose, all of which do not allow the kind of signage proposed for the Midtown Crossing development, as well as the kind of signage put up on its buildings in Hollywood.